Two powerful new Pokémon roar their challenges as the battle begins! Who will you chose? The magnificent live Pokémon Xerneas or the Terrifying Destruction Pokémon Yveltal? The choice is yours in the Pokémon TCG Legends of Kalos Tin! 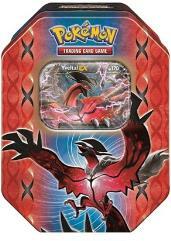 Each of the Excellent Tins contains a special foil card, 4 Pokémon TCG booster Packs, AND a bonus code card for the Pokémon trading card game online.